We’ve rounded up 5 precision ideas that have emerged in a big way in the past several years, and are poised to change food production as we know it. Precision agriculture has been around since the mid-1990s. Every year, though, the practice becomes more accurate and diverse thanks to new technologies. Precision started with two main technologies: Geographic Information Systems (GIS) and Global Positioning System (GPS). Other precision farming technologies include variable rate technology, guidance systems, and various sensors and monitors, such as soil testing and monitoring. All of these allow farmers to use constant electronic feedback to help improve farming methods. When farmers can more affectively use these technologies, they are better able to farm sustainably and to increase the efficient use of inputs and resources and can be more productive. According to the article, “2014 Precision Ag Top 5 Technologies” at PrecisionAg.com, 2014’s top new precision ag technologies to look out for include unmanned aerial vehicles (UAVS), variable-rate application (VRA) seeding, smart data solutions, smart devices, and in-cab solutions. Rooftop farming has taken off in cities where land is at a premium (think New York and Chicago). 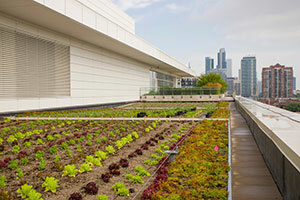 In some cities, such as Chicago, green roofs are even part of the city’s overall sustainability plans. Chicago has about 359 roofs that support vegetation. In addition to producing greens and vegetables (on a per-square-foot basis, rooftop farming’s product yields are often greater than what’s produced by traditional farming methods, and increasing fresh food production in cities, rooftop farming also can reduce a building’s energy costs, and can clean the city’s air. Also: Rooftop farming operations also can benefit the community by providing jobs and giving people a place to congregate. Rooftop farms also can catch rainwater (diverting runoff from sewer systems) and can hyper-localize food production, as trucks no longer need to travel from neighborhood to neighborhood within cities to transport fresh produce. Aquaponics combines aquaculture and hydroponics: Fish waste provides an organic food source for plants, and plants provide a filter for water. In addition to aquaponics’ aforementioned components, there’s also a third component of aquaponics: microbes and composting red worms. Microbes and worms convert ammonia (from the fish waste) into nitrates, and nitrates (and solids) into vermicompost — a plant’s food source. While hydroponics does solve a lot of the issues that come with traditional farming (such as weeds, the amount of water required, soil insects, critters that eat greens, and basic fertilizing and composting methods) it still requires “careful application” and “man-made nutrients.” Aquaponics only requires the fish (along with careful monitoring). Aquaponics also is a relatively safe way to grow food. Custom growing allows people and organizations to purchase plants that are native to the area. Many of these plants include locally adapted trees, scrubs, grasses, and wetland plants. These plants, typically grown by nurseries or conservation plant nurseries, are used in many restoration, revegetation and mitigation projects. Other growing projects can be started with locally adapted seeds, or cuttings. For example, Nevada uses custom growing to help endangered plants thrive. Many urban greenhouses reside atop buildings for space sake. Some of the most impressive urban greenhouses around today include Lufa Farms and BrightFarms Many of these urban greenhouses in production in cities are incredibly sustainable for myriad reasons. New urban greenhouses typically have the ability to capture rainwater, and recirculate irrigation water. Greenhouses, overall, also can reduce energy use, compost green waste, and control pests with biological controls. Urban greenhouses, similar to rooftop farms, also allow food to be harvested in the morning and end up on a local restaurant’s plate by the evening. Many of these greenhouses use some of the most up-to-date technologies, which allow the facility workers to harvest and grow in the most efficient ways possible.